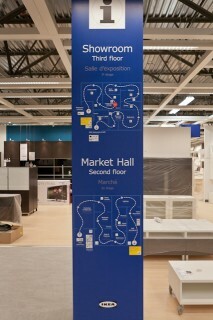 SHOP TALK: Sneak peek inside the new Ikea! Map Quest: Maps are posted regularly along the route to help keep you on track. Photo by John Kealey. 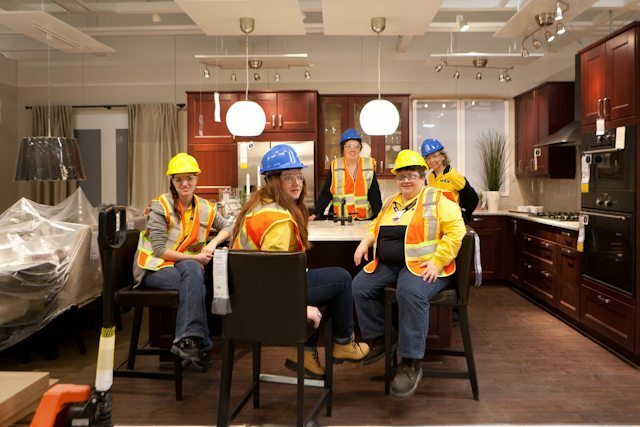 SHOP TALK welcomes Ottawa Magazine editor Sarah Brown, who brings her impressions of the new Ikea. Click on the images to the left to view a gallery of photos from the tour. All photos by John Kealey. Oh, the hype! The hype! It’s the biggest thing to happen to Ottawa retail since Apple opened in the Rideau Centre a few years back — at least in hype terms. (Which begs the question, would you line up longer to be the first buyer to step into Canada’s largest Ikea or to get the latest iPhone?) But I digress. You’d have to be living in a cave not to have internalized at least some of the Ikea mania. Biggest in Canada! A restaurant that seats 600! Every Ikea product in the universe available in one location! So, yes, pretty impressive. And we really, really did want to see it (but without standing in that opening day lineup). And so we played the media card to get a sneak preview just 13 days before the grand opening on Dec. 7. 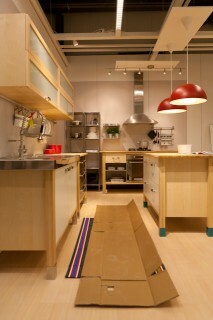 One of 15 kitchen displays in the kitchen showroom section. Photo by John Kealey. Second impression: Boy, there are a lot of different ways to design a kitchen. We run into Interior Design Manager Dan Sloan in the kitchen section where, he proudly notes, there are 15 kitchens. (Actually, there are at least a dozen more kitchens sprinkled throughout the store, but 15 in the dedicated kitchen area. Even we, the jaded, are a little blown away.) The neat part, though, is that these kitchens were designed for the local market — using “kitchen recipes,” as Sloan calls them — based on years of data on Ottawa home sizes, kitchen sizes, and purchasing habits. Very cool, if a little unnerving to be so easily classifiable. Third impression: There’s a lot of work to do. With just under two weeks to go, the interiors are very much a work in progress with workers everywhere and many of the displays still under wraps. It would be fun just to camp out in-store for the next few days to see how it can possibly all come together so quickly. Click on the images to the left to view a gallery of photos from the tour.